we are glad to show our comfortable rooms and cozy apartments. Enjoy your vacation in our tastefully furnished accommodations. Extensive hiking, mountain biking and cross-country ski trails as well as ski slopes and lifts provide for a wide range of outdoor activities. 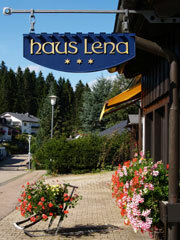 Numerous restaurants and inns in Schönwald and the surrounding area invite you to taste their fine regional specialities. or deliciuos cakes.